We read the other day that Minnie Mouse and Hello Kitty had both been arrested on Times Square in New York City for getting into a fist fight. 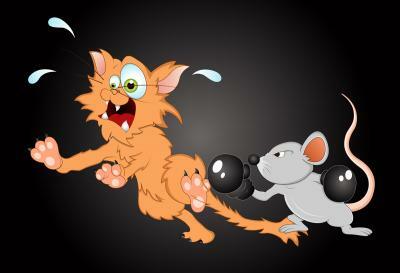 We know from Saturday morning cartoons that cats and mice are mortal enemies in most cases, but for these anthropomorphized versions with their sweet smiles and pastel plush outfits, brawling seems outside their typical nature. Times Square has endured plenty of conflict around the stuffed animal and super hero impersonators who roam the area looking for tourist dollars. This was no doubt the explanation for the scuffle, but it was also speculated that child therapists' appointment books might thicken as a result of the unexpected personality change from these typically benign characters. In the banking world, Fed Chair Janet Yellen spent the press conference after last week's meeting of the FOMC defending the benign nature of a declining unemployment rate and inflation that remains low. Some investors see inflation as a bruising brawler simply waiting to wake up and start swinging. Last week's FOMC meeting had been projected as the targeted time for the beginning of a tightening cycle earlier in the year, but as the economy slowed in Q1 with the strong dollar, winter weather, a drop in oil prices and a drop in exports, the date for higher short term rates moved further out the calendar. Sometimes financial television resembles sports television, with so much effort invested in predicting the exact timing of anticipated FOMC action. The "countdown to the Fed" seems to extend ever longer, but this is not a game. It's the economy. That means it is people's jobs and wages and lives, so getting it right is very important. Raising rates too soon could easily blow the recovery out of the water, while raising them too late could mean they will have to go up faster. The Fed is seeking the perfect mix, but it won't be easy to achieve. This past FOMC meeting was a busy one as it included updated charts with economic expectations and forward looking interest rate projections. This is also where the most interesting information was found. In those updated charts, the Fed laid out a path for raising rates in a manner that may not be as disruptive to the economy as many pundits and investors have feared. First there was a significant downgrade to expected GDP for this year to 1.9%. There was also an update to the so-called "dot chart" which shows where each FOMC member expects the Fed Funds rate to be at the end of calendar years. This meeting's charts showed a significant decline from what was projected at previous meetings. As things stand now, the end of 2015 has a projected Fed funds rate of 0.625%, showing that two rate increases may be due this year. Meanwhile, 2016 projections center at 1.625%. However, the strongest voices on the committee, Chair Yellen (along with Fischer and Dudley) are projected to be somewhat lower. They indicate perhaps one 25bp move in 2015 and a rate around 1.325% for the end of 2016. This all boils down to a Fed that is slowly heading down a rate increase path, and likely, the incline will be very gradual. For now, Sept looks like the most probable time for liftoff, so bankers should be prepared. We don't know whether Hello Kitty and Minnie Mouse ended up being cellmates in a damp NYC jail cell, but we are sure the cat and mouse game will continue. For bankers trying to figure out where interest rates are going and how fast they will move, we expect the best advice is to monitor this publication, other news sources, and commentary from FOMC members. The Fed and Chair Yellen are likely to continue their analysis of the data and adjust their expectations as they inch toward an eventual rate increase, likely later this year. 1) Premier Business Bank ($239mm, CA) will acquire First Mountain Bank ($146mm, CA) for $13.4mm in cash. 2) First Trust & Savings Bank of Albany ($213mm, IL) will acquire Port Byron State Bank ($75mm, IL) for an undisclosed sum. 1) Fifth Third Bank ($138B, OH) will close 100 branches (about 7.7%) through next year as it seeks to boost efficiency, respond to customer behavior changes and improve competitiveness. 2) Yadkin Bank ($4.3B, NC) will sell 2 NC branches to Select Bank & Trust Co ($748mm, NC) for an undisclosed sum. Fed Governor Powell said an improving economy, labor market growth and an expectation that inflation will return to 2% will likely lead the Fed to raise interest rates in Sep and again in Dec. Meanwhile, Fed San Francisco President Williams said the Fed funds rate should be increased between 0.50% and 0.75% if economic data meets forecasts. Finally, Fed Cleveland President Mester said she felt "the economy can support a 25-basis-point increase in interest rates." A Bank Director survey on compensation finds the Top 5 compensation challenges for 2015 are tying compensation to performance (62%); retaining key people (45%); compensation and benefit costs (39%); competitive pay (37%) and developing a succession plan (34%). Wells Fargo has consented to a cease and desist order from the OCC and agreed to pay $4mm related to deficiencies in practices around billing and marketing practices (related to identity protection and debt cancellation products). Online small business lender Kabbage will partner with global delivery firm UPS in a partnership that will give UPS customers access to capital from Kabbage. A survey of consumers by CNBC finds 70% can identify companies that have had data breaches; 15% stopped shopping at breached retailers and 23% stopped using breached payment methods. Unfortunately, nearly 50% of those surveyed said the data breach was the bank's fault as well as the retailers. Treasury yields rose 2 to 3bps as new home sales in May rose more than expected. There will be another revision of Q1 GDP, the market expects -0.2%, an uptick from the previous reading which came in at -0.7%.